Or as my mother used to say, Salmon Croquettes. 1 Remove skin, bones, and other questionable material from salmon, i.e. "pick through". 2 Preheat oven to 400ºF. 3 Toss minced onion and parsley with salmon. Sprinkle the dry spices over the salmon and stir gently. 4 In a separate bowl whisk together oil, garlic, mustard, vinegar, and salmon juice, then toss with salmon. In a separate bowl whisk egg, then toss with salmon. 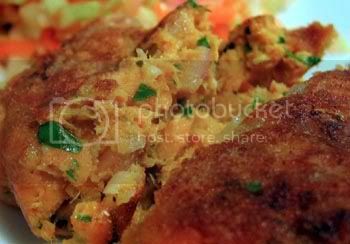 Note: I try to keep some memory of the flaked fish in my salmon cakes, thus the gentle stirring and tossing. The addition of the salmon juice keeps the cake moist. The first few times I made these there they were too dry, like a true cake - a la Duncan Hines. I also omit any flour or bread crumbs for the same reason. They're a little more difficult to handle but the result is nicely light and salmony. 5 Divide the salmon batter into 6 or 7 cakes. Gently form into patties. 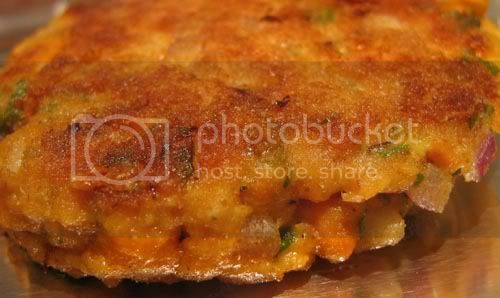 6 Dredge patties: Using a spatula, slide the moist patty onto a plate of flour, sprinkle some flour over the top, flip a few times in hands to wiggle off excess, and transfer to a clean plate until ready to sauté. It's not necessary to completely coat the patty. It's preferable to just dust either side lightly - you won't end up with uncooked floury edges. Note: Dredge the patty immediately before placing it into the pan. If it sits, it will absorb the flour coating and the exterior will have less of a crust. 7 Preheat a 10-inch sauté pan over low-to-medium heat. Just before adding the patties drizzle 1 or 2 tbsp. high-heat oil into the pan. Cook for 2 to 3 minutes per side, then transfer to a baking sheet. Finish in a preheated 400ºF oven for 5 minutes. Note: I serve these with a squeeze of lemon and my yogurt dressing. The FRE scoff's them down. I bask in the notion he's plumping his cells with omega-3 fatty acids.